You would be pressed to find a more dynamic community of this size. Largely because Montpelier acts as a downtown for many of the smaller surrounding communities, this, the nation’s smallest capital city, boasts incredible cultural opportunities. 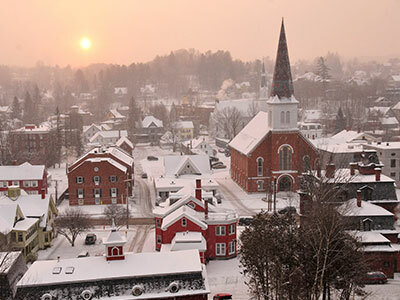 On the hill, Vermont College of the Fine Arts draws writers from all over the world and leads the nation’s low-residency MFA programs. Staples of our active arts community include the Montpelier Chamber Orchestra and the Green Mountain Youth Symphony. The local economy is government and insurance-based and has been stable over the last decade, but the character of this small town is not dressed in a suit and tie. In this capital city, the government remains accessible to locals. Deli counter encounters with the governor and Supreme Court justices are not unusual on State and Main, nor is bumping into a US Senator at the grocery store. It’s not retail politics – it’s just life in Central Vermont. Chefs and food lovers from around the world come for dishes cooked up in Montpelier at the New England Culinary Institute. Local bakeries, sandwich shops, and lunch carts serve as daytime gathering places. Among many restaurants seated here for the business crowd, Main Street Grill and Bar, Sarducci’s and J. Morgan’s provide a variety of fine dining options. Montpelier’s downtown farmers market is the place to see and be seen on Saturday morning. Local farmers, artists, artisans, and musicians gather in the open air market from May through October to deepen connections within the community. The Capital City Farmers Market moves inside during the colder months and is just as vibrant.